1 Preheat the oven to 110°C, gas mark ¼. 2 Put the egg whites and lemon juice into a very clean stand mixer or in a bowl with an electric whisk and whisk until frothy. 3 Add one-third of the sugar and whisk until the mixture trebles in volume and starts to properly resemble meringue. 4 Stop the stand mixer or whisk and add the last of the sugar as well as the vanilla to the bowl. On a very high speed, whisk briefly just to incorporate the sugar, then stop immediately. Although the meringue will look grainy, this adds extra crunch and helps to keep the meringues’ volume and shape better. 5 Pour the raspberry purée into a bowl and lightly ripple it through with a knife, just briefly, to create a marbled effect. 6 Take a large metal spoon and spoon large clouds of the meringue onto the prepared baking sheet. Sprinkle almonds over each meringue. 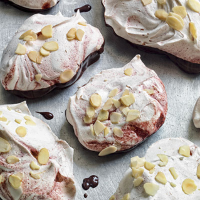 7 Bake in a preheated oven for 1 hour, then turn the oven off and allow the meringues to cool completely inside the oven with the door closed. This could ideally be done overnight. 1 Put the raspberries, sugar and orange juice in a saucepan over medium heat. Bring to the boil, then cook for a further 10 minutes. 2 Allow to cool slightly, then transfer to a blender or food processor and process until smooth. Add a dash of water to make it runnier if you prefer. Pass the purée through a sieve to make it extra smooth. This recipe is adapted from Pâtisserie at Home by Will Torrent, photographs by Jonathan Gregson (Ryland Peters & Small, £19.99).